The Homey VIP Sofa is an Elegant piece of furniture, due to it's original design, it is handmade with high quality materials and handcrafted with care. The front wood panels are real Alder wood finished in Toffee with chocolate glaze. It has a strong wood frame covered with high density flame resistant foam. 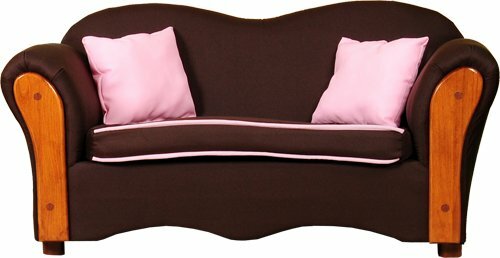 It is a real piece of furniture, upholstered with soft Twill fabric to give your Kids a comfortable place to read and play. The cushion has a removable cover to make it easier to clean. Pillows are included. Look for the matching Chair to create a Beautiful Mini Living Room. Your Kids will love it.